This is an old study. See an updated report here. Note: After press time, Massachusetts enacted a sales tax holiday, bringing the total number of states with holidays in 2012 to 18. 17 states will hold a sales tax holiday in 2012, down from a peak of 19 states in 2010. The authors would like to thank Mark Robyn and Micah Cohen for their work as co-authors of previous editions of this report and Steven Johnson for assisting with the 2012 update. Sales tax holidays are periods of time when selected goods are exempted from state (and sometimes local) sales taxes. Such holidays have become an annual event in many states, with exemptions for such targeted products as back-to-school supplies, clothing, computers, hurricane preparedness supplies, products bearing the U.S. government's Energy Star label, and even guns. High-tax New York State sparked the trend in 1997 as a way to discourage border shopping. 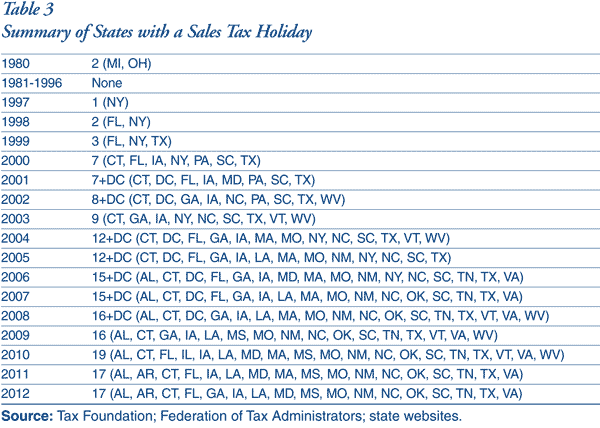 In 2012, 17 states will conduct sales tax holidays, down from a peak of 19 states in 2010 (see Table 1). Thus, a tax on consumption is considered an equitable method of "paying" for government services. Consumption also has the advantage of being relatively easy to track, measure, and tax. Some economists also prefer a consumption tax over an income tax because the former does not tax (and thereby discourage) savings. Ohio and Michigan enacted the first sales tax holidays in 1980 when they offered tax holidays for automobile purchases. But it was New York that sparked the modern trend, with the first sales tax holiday for clothing in 1997. New York's objective was to tackle border shopping, the phenomenon of residents traveling to nearby states to take advantage of lower sales tax rates (particularly clothing purchases in New Jersey). The sales tax holiday gave hope of reducing border shopping without the need of actually having to reduce the state's sales tax rate. A number of states have tried sales tax holi-days and then cancelled them, a trend that has accelerated during the current recession and related state government revenue downturn. Florida and Maryland cancelled their holidays after 2007. Massachusetts cancelled its 2009 holiday after it hiked its sales tax, but reinstated it for 2010 and 2011. Illinois lawmakers declined to implement a new sales tax holiday in 2009 over concerns about the state's budget shortfall, but did enact one for 2010. In 2009, the District of Columbia, faced with declin-ing revenue and a widening budget shortfall, announced the one-year suspension of its August sales tax holiday only weeks before it was scheduled to occur, later repealing it per-manently. Meanwhile, Georgia restored its holiday for 2012. Florida on the other hand, having skipped in 2008 and 2009 returned to having a tax holiday starting in 2010. Many other localities, counties, and towns, and even individual vendors, have opted out of their state's sales tax holidays. As scholar John Mikesell has put it, "State lawmakers are in the position of making a politically attractive decision with the cost of that decision being borne by someone else (local lawmakers), [a] condition[ ] ripe for poor policy choices." Supporters claim that sales tax holidays stimulate the economy. They argue that, first, individuals will purchase more of the exempted goods than they would have in the absence of a holiday, and second, consumers will increase their consumption of non-exempt goods through "impulse" purchases, paying taxes that would otherwise not have been collected. Rather than stimulating new sales, sales tax holidays simply shift the timing of sales. In 1997, the New York Department of Taxation and Finance studied its clothing sales tax holiday and found that while sales of exempt goods rose during the holiday, overall retail sales for the year did not increase. On the contrary, shoppers waited until the holiday to purchase exempted goods, thereby slowing down sales in the weeks prior to and following the holiday. A University of Michigan study looking at computer purchases during sales tax holidays found that timing shifts "account[ ] for between 37 and 90 percent of the increase in purchases in the tax holiday states over [a] 30-week horizon," depending on price caps and particular products. Anecdotal evidence from other states supports these conclusions. Other evidence suggests that sales tax holidays attracted cross-border sales only when other states did not have their own holidays, which is no longer the case. Peter Morici, an economist with the University of Maryland, told the Washington Examiner in 2006 that a sales tax holiday "has to be a novelty to be a measurable success and it's no longer. "As the costs of squeezing a disproportionate number of sales into a short period of time have become clear, evidence suggests that fewer shoppers participate. For the vast majority of those who shop during sales tax holidays, the holiday simply provides a modest windfall, or unexpected benefit, for doing something they would have done anyway. "Impulse" purchases occur whenever consumers shop, and if consumers merely shift their tax-free purchases, as the evidence suggests, their "impulse" purchases during a sales tax holiday are likewise shifted from other time periods. The increase in tax revenue would be far outweighed by the lost revenue from the much larger amount of tax-free purchases. It is therefore unlikely there is a net revenue gain from additional "impulse" purchases. And even if the "impulse" argument were true and consumers are essentially tricked into making extra unnecessary taxable purchases, that would contradict the argument that sales tax holidays are designed to provide a tax cut for consumers. Recent budget difficulties have prompted some states and localities to cancel or opt out of their sales tax holidays. The District of Columbia Office of Taxation and Revenue estimated that it would save $640,000 in tax revenue by canceling its sales tax holiday in 2009. After eight years of sales tax holidays, District tax officials found the holiday did not spur enough economic growth to offset the costs. Other states would be wise to follow D.C.'s lead and re-evaluate the costs and benefits of sales tax holidays. For example, the New Mexico sales tax holiday exempts computer microphones but not headsets, blank painting canvas but not dry erase boards, and backpacks but not duffel bags. Many states exempt backpacks during their "back to school" sales tax holidays even though a student may prefer to purchase a comparably priced messenger-style bag or duffel bag which accomplish the same functional goal but are not tax-exempt. The sales tax holiday raises the price of these items relative to the backpack and so the student is influenced to purchase the backpack. Though she saves a little money on the purchase, she ends up with a less suitable product that she would not have purchased in the absence of the holiday. Researchers at the University of West Florida studied the price effect of Florida's sales tax holiday in 2001. Using ten different types of apparel across ten retail locations, data was collected over a three-week period to analyze whether before-tax prices were comparable before, during, and after the sales tax holiday. Based on the prices observed in Pensacola before the sales tax holiday, it was expected that shoppers would save $125.58 during the holiday. Due to changes in the before-tax price of the various products, actual savings observed during the holiday were $100.06. In short, retailers absorbed up to 20% of the benefit of a sales tax holiday, significantly reducing the benefit that consumers received. Their study is not conclusive for all tax holidays, but it strongly suggests uncertainty about how much consumers actually benefit from sales tax holidays. Sales tax holidays force businesses to operate under more than one set of sales tax laws each year. These include non-intuitive and sometimes absurdly minute regulations about the holiday's operation. For example, Mississippi's sales tax holiday regulations prohibit the sale of individual shoes (evidently done as a way to get under the holiday price cap), permit the use of coupons, prohibit layaway sales but permit rain checks, and exclude shipping costs from the holiday. Virginia's sales tax holiday permits layaway sales and rain checks, does not permit rebates to lower the sales price, and excludes shipping but includes handling. South Carolina subjected layaway sales to tax during its holiday. Texas exempts layaway sales as well as shipping, handling, and even installation costs as part of its Energy Star product tax holiday. Vermont's sales tax holiday for computer purchases in 2004 applied to keyboards and a mouse, but not printers, unless purchased as part of a bundled package, with the enigmatic caveat that "(1) the package is sold for $4,000 or less and (2) the most common selling price of items that would be taxed if charged separately is not more than $250 or 15 percent of the selling price of the package, whichever is greater." Pennsylvania's 2000 holiday taxed computer accessories, but they became exempt for the 2001 holiday, even when not purchased with a computer. 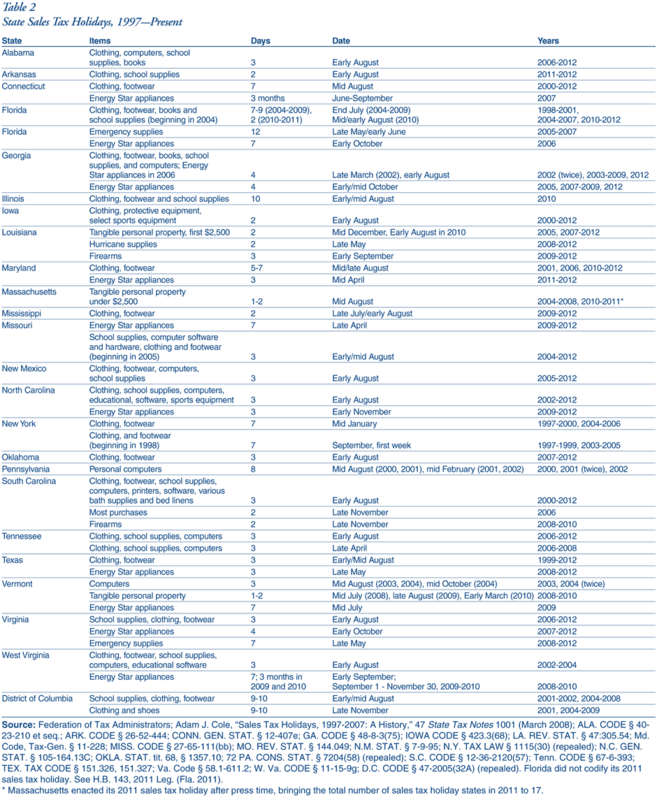 Virginia's hurricane preparedness holiday is ostensibly to help consumers stockpile needed supplies, but the list there is arbitrary as well. Cell phone chargers are exempt but laptop chargers are not. Duct tape is exempt but not masking or electrical tape. What some states include is somewhat unusual. South Carolina included "bath wash clothes, blankets, bed spreads, bed linens, sheet sets, comforter sets, bath towels, shower curtains, bath rugs and mats, pillows, and pillow cases" in its general sales tax holiday. Virginia includes "clerical vestments" in its definition of clothing, along with suspenders (listed twice). Instability in tax law is costly to the economy not only because of complexity but also because it disrupts the plans and expectations of consumers and businesses. Not every state codifies its sales tax holiday in law; some instead pass a new bill establishing it each year. Florida alternated between having a holiday, not having one, and now having one again. New York did the same. Even states that have codified them can suspend them. Washington D.C.'s last-minute cancellation of its 2009 sales tax holiday created more costs and left everyone involved uncertain. The sudden change meant businesses had to change their pricing systems and registers yet again. Time discrimination also has serious negative consequences for some consumers and businesses. Some consumers may be unable to shop during the sales tax holiday because they're working, are out of town, or are between paychecks. Presumably they are no less deserving of a tax break than consumers who can shop during the holiday, but the nature of the timing leaves them out. If the purpose of sales tax holidays is to make school supplies and clothes cheaper for low-income individuals, then a 4 to 7 percent price reduction for all consumers, but only for a brief period, is an odd and ineffective way of achieving it. It's an example of politicians using a fire hose when a garden hose will do a better job. Such government manipulation of consumer timing decisions is unwarranted and economically damaging. Experience shows that political decisions about holiday scheduling and product selection are often arbitrary and sometimes wholly unpredictable. Distorting consumer behavior with sales tax holidays is frequently not to consumers' benefit. Some state legislatures sought to use tax policy to reaffirm support for gun rights. This goal was apparently the motive behind South Carolina's decision to hold a gun sales tax holiday for two days after Thanksgiving in November 2008. State Representative Michael Pitts (R), who sponsored the House bill, stated that the holiday "was politically designed to bring recognition to the importance of the Second Amendment." The taxpayer savings were estimated to be minimal: just $15,000. The bill was put into law over the veto of Governor Mark Sanford (R), who wrote, "While we support the intent underlying sales tax holidays, we are vetoing this bill because we don"t believe that sales tax holidays are an effective method of promoting energy efficiency or the Second Amendment." The South Carolina Policy Council also criticized the holiday: "This is a symptom of a problem we have; there will always be pet projects that individuals support. If we allow lawmakers to tinker with the tax code for everything they support at the expense of those they do not, we"ll end up with what we have now, which is an absurdly complicated tax code." In May 2009, the South Carolina Supreme Court struck down the gun sales tax holiday law because it combined different sales tax holiday topics into one bill, violating a state constitutional provision barring such "logrolling." The legislature re-enacted the gun sales tax holiday, scheduling it for November 27-28, 2009. In July 2009, the media attention resulted in Louisiana enacting a similar "Second Amendment" tax holiday, to be held in early September 2009. A similar proposal in West Virginia was vetoed by Governor Joe Manchin (D) in April 2010. Louisiana will hold a gun sales tax holiday in 2012. Sales tax holidays provide savings to all income groups, not just low-income individuals. People of every income level can and do buy goods during sales tax holidays. If the purpose of sales tax holidays is to make school supplies and clothes cheaper for low-income individuals, then a 4 to 7 percent price reduction for all consumers, but only for a brief period, is an odd and ineffective way of achieving it. It's an example of politicians using a fire hose when a garden hose will do a better job. If policymakers genuinely want to save money for consumers, then they should cut the sales tax rate year-round. While the rate reduction may be modest, such a change would put the same money back in taxpayers' hands without the distortions and complications associated with a sales tax holiday. For example, applying the revenue loss from a 2008 New Jersey tax holiday proposal could reduce the state's sales tax rate from 7% to 6.6% year-round. If tax relief for consumers looks good for a few days, why not give it to them all year long? Some advocates of limited government may support sales tax holidays as a way of reducing revenue and putting it in consumers' hands. However, if the ultimate policy goal is reducing government involvement in individual and market decisions, sales tax holidays are a poor choice due to their complexity, administrative burdens, distortions, and arbitrary government micromanaging. Thus, the government's meddling in the economy grows, even with the temporary and modest reduction in tax revenue. As scholars Hawkins and Mikesell put it, sales tax holidays are "a Soviet-style state-directed price reduction on items selected by the state…" If prices fall during sales tax holidays, the public can have the dangerous impression that government can control prices, something that should be anathema to conservatives and libertarians. Because states must balance their budgets, and because states rarely if ever cut spending to offset the revenue loss from sales tax holidays, the net result is that taxes must go up somewhere else now or in the future. There is no free lunch and tax cuts do not exist in a vacuum. Pushing for a sales tax holiday without associated spending cuts means that government will probably bring in just as much revenue, but now with a complex, distortionary, and burdensome sales tax holiday added. Offsetting tax increases, whether in the form of an increased sales tax rate or increased taxes elsewhere, could be just as economically damaging. Tax holidays are a gimmick that distract policymakers and taxpayers from real, permanent, and economically beneficial tax reform. Their creation came about as a way to avoid addressing the negative effects of high sales taxes. Politicians often receive favorable media attention for pushing for these short-sighted policies, denigrating the hard work of those who support genuine tax relief. For the paltry tax relief associated with sales tax holidays, as our former colleague Jonathan Williams argued, "Politicians can pose for photo-ops as ‘friends of the taxpayer,' while pushing off the hard work of tax reform for another day." In response, New Hampshire launched a $40,000 ad campaign emphasizing the number of days each state has with no sales tax ("New Hampshire: 365, Massachusetts: 2"). See Alicia Hansen, "New Hampshire's 365-Day Sales Tax Holiday," Tax Foundation Tax Policy Blog (Aug. 4, 2005), at http://www.taxfoundation.org/blog/new-hampshires-365-day-sales-tax-holiday. Not included in our list are Ohio and Michigan's 1980 sales tax holiday for car purchases, nor four gas tax holidays adopted between 2000 and 2005 (Florida, Georgia, Illinois, and Indiana). For information on state gas tax holidays, see Jonathan Williams, "Paying at the Pump: Gasoline Taxes in America," Tax Foundation Background Paper, No. 56 (Oct. 2007), at 14-16. See, e.g., Alabama Department of Revenue, "Local Governments That Have Notified the Department Regarding Participation," available at http://www.ador.state.al.us/salestax/STholiday.htm (listing 59 localities that have opted out of the state sales tax holiday); Missouri Department of Revenue, "Back to School Sales Tax Holiday—Cities Opting Out," at http://dor.mo.gov/tax/business/sales/taxholiday/school/cities.php (listing 172 cities that opted out of the state sales tax holiday); Larayne Brown, "Shoppers throng to state's sales tax holiday," Jackson Clarion-Ledger (Aug. 1, 2009) ("Kathy Waterbury, spokeswoman for the [Mississippi] State Tax Commission, has gotten reports that some retailers weren't participating in the event."). However, in most states with sales tax holidays, retailer participation is not optional. John L. Mikesell, "State Sales Tax Holidays: The Continuing Triumph Of Politics Over Policy," 2006 State Tax Notes 107, 112 (Jul. 10, 2006). New York Department of Taxation and Finance, "The Temporary Clothing Exemption," November 1997, p. 23, at http://tinyurl.com/nytaxholiday. Adam J. Cole, "Christmas in August: Prices and Quantities During Sales Tax Holidays," May 2009, at 23. In a separate paper, Cole suggests the shifts are short-term ones, finding "no evidence that purchases are shifted across months to exploit the tax holiday in sufficient amounts to impact tax collections in months preceding or succeeding the month of a tax holiday." Adam J. Cole, "The Fiscal Impact of Sales Tax Holidays," May 2009, at 3. See, e.g., Jenny Kincaid Boone, "Virginia's sales tax holiday: just the icing on the cake," Roanoke Times (Aug. 5, 2009) ("Larie Thompson…decided to get a head start on the sales tax holiday. She took her two daughters to the Bonsack Wal-Mart to scout out school deals, but she planned to wait until the tax-free weekend to buy them. "); Emilie Bahr, "New Orleans merchants hope sales tax holiday brings boost," New Orleans Citybusiness (Aug. 3, 2009) ("At The Garden Gate on Old Metairie Road, for example, manager Sara Draper said some customers will select a fancy fountain or bench but wait to swipe their credit cards until they can get the item during the tax-exemption period. "); Louis Llovio, "Sales-tax holiday on school supplies starts Friday," Richmond Times-Dispatch (Aug. 2, 2009) ("Diane Parnell, who was shopping with Reason at the Target on Midlothian Turnpike last week, said she will do some shopping before the tax holiday begins, but will wait until the weekend to buy most of the supplies on her children's list. "); LaTina Emerson, "Georgia's sales tax holiday starts Thursday," Augusta Chronicle (Jul, 29, 2009) ("Robyn Linen of Grovetown was shopping at Target…. She usually waits until the holiday so she can save money, she said. "); Emma Brown, "Shoppers go for the gold on tax holiday," Boston Globe (Aug. 17, 2008) ("‘We're going to come back again tomorrow' for a stove, said Mariam Haddad of Somerville, who waited until this weekend to buy a crib for her day-care business and a digital camera for her 14-year-old daughter."). The Tax Foundation has also received calls from individuals asking about the likelihood of their state conducting a sales tax holiday, with the caller's intent being to postpone purchases if a holiday occurs. See, e.g., Josh Barro, "Even Proposing a Sales Tax Holiday Creates Instability," Tax Foundation Tax Policy Blog (Oct. 21, 2008), at http://www.taxfoundation.org/blog/even-proposing-sales-tax-holiday-creates-tax-instability. Dena Levitz, "Sales tax holiday returns to Maryland," Washington Examiner (Aug. 23, 2006). See, e.g., Mary Worrell, "Sales tax holiday a bust for some retailers," Hampton Roads Business Journal (Aug. 13, 2007) ("Zenisek spent money advertising the tax-free weekend in area publications and had more employees in-store anticipating an influx of traffic, which she never saw. "); Mark Albright, "Sales tax holiday's appeal may be slipping," Tampa Bay Times (Aug. 2, 2007) ("‘I'm done,' proclaimed the Largo nurse and mother of three during a recent outing at Target, ‘I shop the sales year round for real deals. I'm trying to be more practical. I won't be fighting crowds for the small savings during the sales tax holiday. '"); Jenny Munro, "Budget-conscious shoppers welcome sales tax holiday," Greeneville News (Aug. 5, 2009) ("Mel Lester, who was shopping for summer shorts for her two children, said she probably wouldn't shop on the sales tax holiday weekend. ‘You don't save enough to make it worth fighting the crowds,' she said. "); Christel Phillips, "Many East Texans not waiting for tax free weekend to shop," KTRE (Lufkin, TX) ("‘Parents tend to do it two weeks in advance,' said Maria Hernandez, a JC Penny store manager. She says many parents don't want to take a risk when school is just around the corner…. Some store managers recommend shopping before the tax free weekend to avoid missing out on items that could be out of stock."). 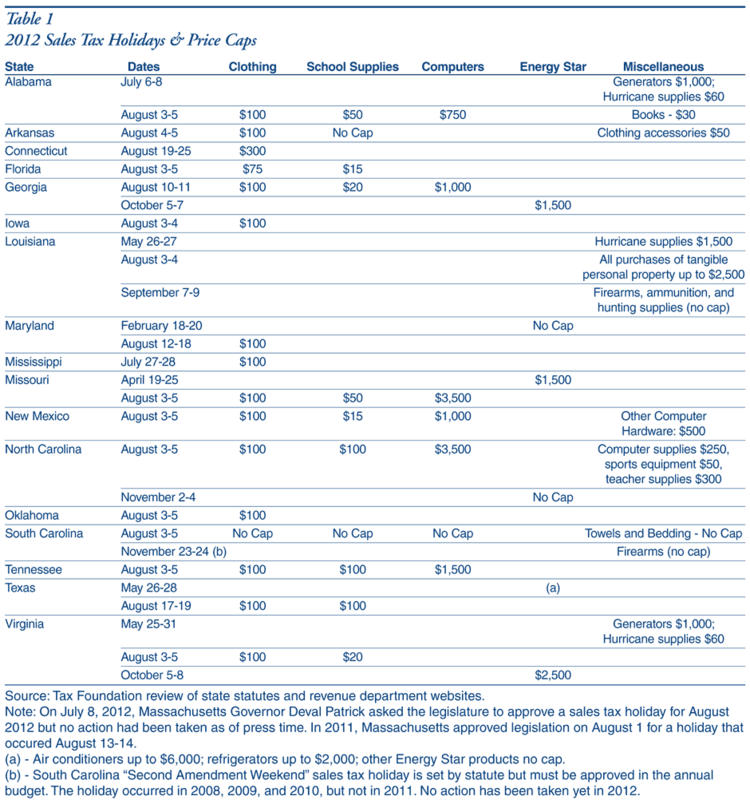 See, e.g., Micah Cohen, "A True Cause for Celebration: DC Cancels Sales Tax Holiday," Tax Foundation Tax Policy Blog (Jul. 22, 2009), at http://www.taxfoundation.org/blog/true-cause-celebration-dc-cancels-sales-tax-holiday. See, e.g., David Brunori, "The Politics of State Taxation: Dumber Than a Bag of Hammers," 2001 State Tax Notes 48-63 (Mar. 12, 2001). After listing many of the flaws of sales tax holidays and citing scholars on left and right, Brunori colorfully writes that sales tax holidays are "dumber than a bag of hammers." See Kendall Hatch, "Restaurants Seek Their Own Tax Holiday," Taunton Gazette (Feb. 7, 2011); S.B. 1528, 2011 Leg. (Mass. 2011). See, e.g., Mark Robyn, "Border Zone Cigarette Taxation: Arkansas's Novel Solution to the Border Shopping Problem," Tax Foundation Fiscal Fact No. 168 (Apr. 2009), at http://www.taxfoundation.org/publications/show/24599.html. See, e.g., Josh Barro, "New York Governor David Paterson's Tax and Fee Proposals a Mixed Bag," Tax Foundation Fiscal Fact No. 159 (Jan. 2009), at http://www.taxfoundation.org/research/show/24230.html (noting that the New York clothing exemption will cost $462 million in FY 2009-10 and $660 million in FY 2010-11). The exemption was enacted in 1999, repealed in 2003 with tax holidays offered instead, and then re-enacted in 2006. New York City exempted all clothing of any price from its local sales tax from 2005 until August 1, 2009, when it adopted the state's price cap. In December 2008, as interest groups of all kinds sought a piece of federal stimulus proposals under consideration, a group of large retailers pushed Congress to adopt three nationwide sales tax holidays for 2009. See, e.g., Ann Zimmerman, "Retailers Want In on Stimulus Plan," Wall Street Journal (Dec. 24, 2008). The group stated its proposal would be stimulative, and pointed to a survey that 82% of consumers favored a sales tax holiday and that 69% said they would make purchases they otherwise wouldn't make. That consumers support receiving benefits when no costs are explained to them shouldn't be surprising. The economic evidence from various studies provided in this report undermines the idea that many additional purchases would occur, especially in a recession. See Richard Harper, et al., "Price Effects Around a Sales Tax Holiday: An Exploratory Study," Public Budgeting & Finance 23 (Winter 2003): pp. 108-113. The University of Florida researchers noted that prices also rose in nearby Mobile, Alabama, suggesting that some of the price increase occurred for reasons other than the sales tax holiday. Cole found in his study of computer prices during sales tax holidays that the holiday induced retailers to raise prices of inexpensive laptop computers but lower prices of inexpensive desktop computers. See Adam J. Cole, supra, "Christmas in August." Additionally, scholars Richard Hawkins and John Mikesell note that retailers' ability to raise prices are more constrained during recessions. See Hawkins and Mikesell, supra, 2001 State Tax Notes 45-56. Further research analyzing price effects before and during sales tax holidays would be valuable. See, e.g., Michael Handy, "Sales tax holiday not all it's cracked up to be," WBTV (Charlotte, NC) (Aug. 3, 2009) ("If you looked at the fine print in Sunday's newspaper advertisements, you may have noticed some of the best sale prices will end several days before tax-free weekend. In fact, JC Penney started a huge sale on Sunday which ends Tuesday. For example, Levi Jeans are marked down to $32.99 which is $11 cheaper than the normal price. If you wait for the sales tax holiday, you will pay the full price of $44 and save only $3 in taxes. Belk is also offering some of its best prices from now until Tuesday, including an extra 15 percent off all home purchases. Remember, you will save only seven percent if you wait for tax-free weekend. Some retailers are honoring their discounts for at least part of the sales tax holiday. Office Depot, Best Buy, Target and Sports Authority are running their biggest sales from now through Saturday. In these cases, you are better off waiting until the weekend."). See also David Brunori, "The Politics of State Taxation: Welcome to the Club?" 2001 State Tax Notes 265 (Jan 22, 2001) ("I talked to several retailers in New York, who said they raised prices considerably knowing that people thought they were saving money by shopping tax-free."). See, e.g., Mary Worrell, "Sales tax holiday a bust for some retailers," Hampton Roads Business Journal (Aug. 13, 2007) ("Corprew said larger corporations and department stores have the luxury of big computer systems to calculate tax-free items, but for a small business like her clothing shops, she and her partner spend hours photocopying receipts and organizing sales information just to make sure everything is accurate and in order. ‘We have to split all the details and it's a tremendous amount of work for us,' Corprew said."). See Mississippi State Tax Commission, "Official Guide For 2009 Sales Tax Holiday," at http://www.mstc.state.ms.us/taxareas/sales/06-03-09SalesTaxHolidayGuide.pdf. See Virginia Department of Taxation, "Sales Tax Holiday for Clothing and School Supplies Guidelines and Rules," at http://www.tax.virginia.gov/Documents/School%20Supplies%20and%20Clothing%20Sales%20Tax%20Holiday%20Guidelines.pdf. See Texas Comptroller of Public Accounts, "Energy Star Sales Tax Holiday," at http://www.window.state.tx.us/taxinfo/taxpubs/tx96_1331. Vermont Department of Taxes, "Temporary Exemption for Computers August 7-9 and October 9-11, 2004," at http://tax.vermont.gov/pdf.word.excel/legal/tb/TB30.pdf. See Mark Robyn, "Virginia's Hurricane Sales Tax Holiday," Tax Foundation Tax Policy Blog (May 20, 2009), at http://www.taxfoundation.org/virginias-hurricane-sales-tax-holiday. See Kail Padgitt, "VA Sales Tax Holiday," Tax Foundation Tax Policy Blog (Aug. 5, 2009), at https://taxfoundation.org/blog/va-sales-tax-holiday. See, e.g., Pat Hatfield, "The mystery of Florida's vanishing sales tax holiday," The Deland-Deltona Beacon (Jul. 8, 2008). See, e.g., WJLA News, "D.C. Shoppers Fuming Over Canceled Holiday Tax Relief" (Jul. 20, 2009), at http://www.wjla.com/news/stories/0709/641909.html. Another example would be a desire to move the timing of consumer spending, such as with stimulus packages. Whether this would be effective economic policy can depend on one's view about the effectiveness of stimulus packages, although sales tax holidays would likely be too small and too temporary for even a stimulative boost to aggregate demand. Similarly, stimulus proposals in 2009 for a federal payroll tax holiday were rejected in favor of direct government spending. Sarita Chourey, "Critics say sales tax holiday makes code too complicated," Augusta Chronicle (Nov. 23, 2008). See Joseph Henchman, "South Carolina Prepares for Gun Sales Tax Holiday," Tax Foundation Tax Policy Blog (Nov. 26, 2008), at http://www.taxfoundation.org/blog/south-carolina-prepares-gun-sales-tax-holiday. 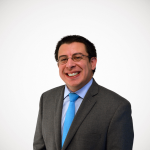 See Joseph Henchman, "Louisiana Tax Credits: Politicians Picking Winners and Losers," Tax Foundation Tax Policy Blog (Jul. 11, 2009), at http://www.taxfoundation.org/blog/louisiana-tax-credits-politicians-picking-winners-and-losers. See Mannix Porterfield, "Manchin guns down NRA-backed bills," Beckley Register-Herald (Apr. 3, 2010). Louisiana Office of Homeland Security & Emergency Preparedness, "Before & After a Hurricane Fact Sheet," at http://www.ohsep.louisiana.gov/factsheets/todohurrsht.htm ("Don't light candles."). See, e.g., Josh Barro, "New Jersey Republicans Propose Sales Tax Holiday," Tax Foundation Tax Policy Blog (Oct. 14, 2008), at http://www.taxfoundation.org/blog/new-jersey-republicans-propose-sales-tax-holiday. Jonathan Williams, "Holiday Season ‘Tax Holidays' No Break for Taxpayers," Myrtle Beach Sun News (Nov. 23, 2006), available at http://www.taxfoundation.org/research/show/2017.html.